Tomball, TX – As a longtime PGA Tour professional, David Ogrin showed his dedication and perseverance by playing in more than 400 Tour events before registering his first official victory in his hometown Texas Open in San Antonio, besting, among others, a charging Tiger Woods. As a golf course architect, he is still as dedicated as he always was on the golf course, but thankfully for Texas golfers, it didn't take him as long to find a winner, coming up with a smash hit in his first solo design effort, High Meadow Ranch located just north of Houston. 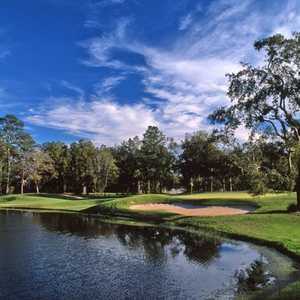 The public access golf course, situated between the small towns of Tomball and Magnolia , off Highway 249 is less than a hours drive from almost anywhere in Houston and worth the effort to experience this tree-filled piece of easy country living. "What I was looking for in my first course was a place that was laid back and family friendly. A place you wouldn't mind dropping your kids off for the day to play golf, have lunch and maybe shoot a few baskets," Ogrin said. "I wanted a place, you could come out after work to get in a quick few holes or come out during the weekend for a relaxing 18 holes in beautiful scenery." Well, consider it mission accomplished as the par 72 course fulfills all that and more at the Ranch. For one thing, Ogrin designed the course in three six-hole loops with each loop going back to the clubhouse. That way, a junior just learning the game or a player pressed for time can do just one or two loops and feel like they have gotten a complete examination of their golf game. The three loops are titled Forest, Pine Barren and Signature for their design characteristics and each offers its own mini-golf journey. One of the best things about High Meadow Ranch and its distinctive loops is it looks as if it's been there a very long time even though the course opened in early 2000. At the large, rustic, wooden clubhouse there is a large wooden directional signpost, which points the way to several different locations: from Texas A&M University (Ogrin's alma mater and favorite place) to the University of Texas (A&M's heated rival) and the Birthplace of Golf, St. Andrews, Scotland. Each of the holes at High Meadow was given a different name, which relates to its particular design feature. From Big Jack and Johnny's Pond, to Cathedral Bunker and The Wall, each hole has a history and a unique feature, which makes it fun to play and challenge separately and as part of a matched set. Before attempting to lay out his first course, Ogrin visited with Ben Crenshaw, a legendary Texas player and one of the best golfer-turned-architects in the nation. 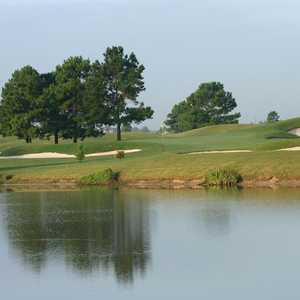 He has designed some of the top rated courses in Texas and around the country, including his newly opened home course, Austin Golf Club. Crenshaw gave Ogrin plenty of advice and would be pleased to see that his student followed the teacher's tips perfectly. "The first thing he did was give me a bunch of (architect) Donald Ross' books and told me about taking what the land (naturally) gives me," Ogrin recalled. "They told me to always personally stay on top of the project, always fight for golf and what I believe in and he also told me it's not as hard as some people want to make it. He said to walk the land and see the holes before I began construction." With those words of wisdom in mind, Ogrin began walking the course and plotting the holes and the result was a remarkably good and playable effort by any first-time designer. The fun starts right off the bat on the Forest Loop, at the opening hole, a par 4, which plays 388 yards from the back, or medal tees, a slight dogleg left with the green separated from the fairway by a short patch of barren ground. Like many of the holes at High Meadow Ranch, the approach shot to the green must land on the putting surface, then risk the chance of rolling away from the pin or even off the green. 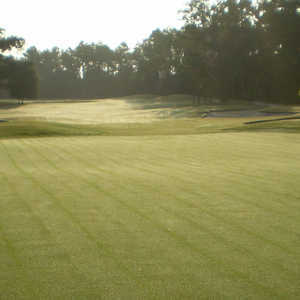 The par 5 second, Big Jack, is a long and narrow fairway with large trees on both sides. There is more separation between the fairway and green and a chance to run the ball through the fairway and into the rough if you're not careful with your second shot. The par 5 fourth hole is the longest on the course at 577 yards from the back tees and features a large split fairway which players, on their second shots, can either play to the left or the right depending on where the pin is located on the green and what the golfers considers the best angle to the flag. The opening par 3, the fifth hole, is labeled 'Deception' because it seems shorter that the 219 yards listed. But with sand all along the right side, it can snare any tee shot which comes up short. The second loop, Pine Barren, begins with a sharp dogleg right, par 4 titled 'Ancient History' because of some of the Southeast Texas artifacts dug up their during construction. Water comes into play for one of the few times on the par 4 seventh hole where the drive from 488 yards from the back tees is challenged by a large manmade lake on the right side which runs from the middle of the fairway all the way to the greenside. Any shot pulled right off the fairway is likely wet, so caution and a safe par is the order of the day on this hole. 'Spectacle' is the second par 3 on the course, No. 9, and it plays 254 yards all the way from the back markers. The name comes from the large, rounded green, which is backed by huge pine trees. Truly a scenic spectacle for anyone standing on the tee box and looking at the green. The par 5 10th hole is titled 'The Scrapes' and it's easy to see why as the fairway is interrupted by a small rock strewn pathway midway from the tee box to the green. Golfers must either lay up in front of this rocky area or try to bang their drive over it, truly a massive hit off the tee, especially if the wind is in your face. The par 3 11th is the shortest on the course, but that doesn't necessary mean easiest as it is intersected by large dirt and native grass areas on the right and trees ringing the green. An accurate tee shot is needed for any success here. The final loop, Signature, is highlighted by the par 4 15th with its Cathedral Bunker, a huge sand and grass feature lining the right side which plays tribute to the famed Church Pew bunkers at Oakmont Golf Club outside of Pittsburgh. The par 4 17th, 'Hidden Runway', sweeps down from one of the higher points of land on the property to a slightly hidden fairway, which moves slightly left to a heavily bunkered green. The par 4 18th, is really special and a fitting conclusion to a very interesting and entertaining course. Players tee off facing a narrow ravine halfway between the tee and the green. Most big hitters will try to carry the dry patch, but that sets up a better decision on the second shot. The fairway slopes downward and the green is fronted by a large brick wall that Ogrin said was on the property when work began on the course and developers decided to leave intact. The green is perched above the wall, giving golfers the chance to fly the ball to the green, but also have their short shots hit the wall and bounce back toward them or off into the ever-present woods. The large green is one of the most undulated on the course, making this one of the most unique holes anywhere in Texas. There is a large clubhouse restaurant, on-site lodging facilities in the future, and many home sites for sale on and around the course. One round at High Meadow Ranch will make golfers happy that Ogrin got it right on his first architectural effort instead of having to wait through a couple of hundred near misses.